1930s Paris. Jewish Europeans are moving west to escape the rise of Nazism. Two of them meet: one of them is a Hungarian photographer, the other is a German activist. Both are full of youthful confidence and fearless in pursuit of their goals. 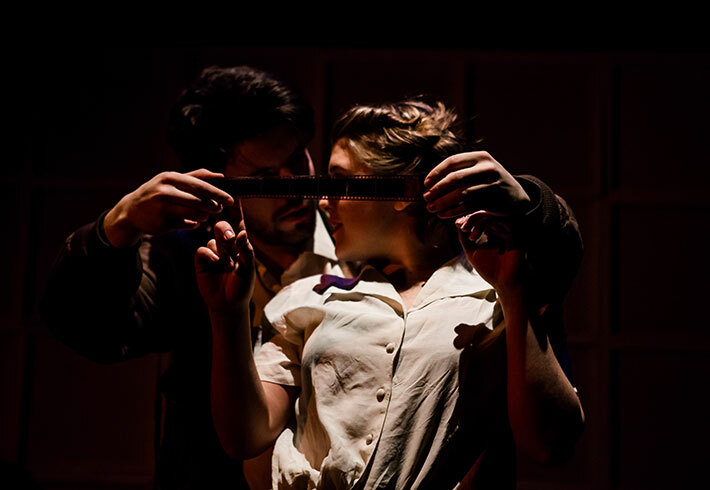 Emerging company Idle Motion uses physical theatre, light, sound to tell the story of these young lovers, their legacy and the importance of photography. Firstly, Shooting With Light is a love story. Two young people meet, fall in love and take the world by storm before ending in tragedy. These young people are Gerda Taro and partner Robert Capa (after they changed their names), pioneering photojournalists of the Spanish Civil War. Gerda and Robert start working together; Gerda is initially his assistant who supports him in reinventing his persona in order to make the professional contacts he needs to succeed. Her talent overcomes this role however, and she eventually develops an independent reputation for honest, brave documentation. Partly fictionalized but based on Gerta’s brief life, we see Robert teach her to use a camera followed by her passionate rise to renowned photojournalist needing to show the world the reality of life on the front lines. Alternating with this storyline is the time-jumping subplot of Robert’s brother Cornell and his assistant June, seeking to amalgamate Robert’s work after his death. They are frantically searching for a mysterious red suitcase Robert once spoke of in order to complete the archive of Robert’s work. Interspersing the scenes of historical naturalism are transitions using visual and physical theatre, similar in style to Frantic Assembly. This is an on-trend performance aesthetic, but one that is visually appealing and provides another level of insight into the characters and their struggles. The most effective of these sequences show Taro and Capa falling in love over rolls of negatives towards the beginning, and Taro’s fight to access the front lines with her camera towards the end. The set is simple in appearance as several blocks and a white screen, but they transform using projections, light and a series of doors. Like their narrative, the structure is simple but highly effective and tells an excellent story. Projections of Taro’s work add further historical context and support the world of the play – the audience sees what she sees and experiences. The company of five twenty-somethings work wonderfully together, and so they should as they met in secondary school. Shooting With Light captures the infectious enthusiasm and ambition of youth, no doubt mirroring their own attitudes that the world is theirs to have and success is a given if they work hard enough. It will be interesting to see how their work develops as they age and experience the challenges and hardships of working in the arts. As visually appealing as their work in now, it needs more depth of human experience. June and Cornell’s quest to locate Capa’s missing work is arguably the more interesting side of the story, but neglected in favour of Taro’s and Capa’s exciting lives and career progression. The ensemble also lacks diversity of age and ethnicity, something that I hope they increase in the future. Idle Motion have an obvious gift for storytelling and integrating various performance styles at this young age, so the world really could be their oyster as they continue to grow.